It is 26th December t0day. After all the feasting and merry making, I decided to take a peek at my last year entry. The day the tsunami took so many lives in my little island here. I still feel a tightness in my chest as I read my own account of the tremors I felt at my home in Penang. At the time of writing that post, the tsunami had not hit Penang shore. My post which was full of humour was written spontaneously, probably around 12noon – 1pm. It was only after I pinged that I learnt of the many lives lost. I would like to recycle this tremors/tsunami post as it depicts very clearly how scary a tremor was. I have many lives under my responsibilities and therefore, my fear was magnified as many times as the number of children I had. 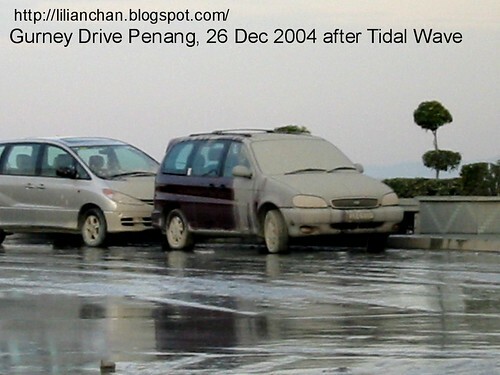 A pic I took a few hours after the tidal wave/tsunami on 26th December 2004. At that time, no one use the name tsunami. They call it tidal wave. TITLE : They day my hubby thought I am a herd of elephants. My apologies – when I blogged this, I have no idea of the impact and fatalities involved. My heart goes out to the affected families. Let us pray for all those affected. I only found out the tragedies of lives lost after I blogged and PING at Petaling Street Project. Penang island experienced a tremor today. In case you KL-ites do not know what a tremor is, it is the distant cousin of an earthquake. Sumatra island get earthquake, we get tremors. The feeling is like having drank far too many beers when things begin moving, doors creak, furniture swaying. It happened before but this morning, 26th December 2004 is by far the longest and most obvious. My usual morning wake up time is 11.30 am but I decided to be extra holy and woke up at almost 9am. Toddler stirred and thrashed in bed, indicating he wanted breakfast in bed. The man I had been married to for 16 years was playing a game of rock, scissor and knifeâ (one-two-som) with me on who should go to the kitchen to prepare ˜breakfast for our kid. But since I decided to be extra holy and listen to St. Paul word of ˜Wives, submit to your husbands , I obediently went to the kitchen. (hey, I ran a breastfeeding support group so I have obligations not to say i went to the kitchen to make a bottle of milk using a plastic bottle with silicon teats and use milk that comes from cow with ABC brand which is enriched with calcium and iron and fortified with DHA). Things started to get wobbly and the siren we had in our apartment units started screaming. We have a siren which the guards will activate when flood waters get high. Neighbours are already shouting for people to go down to the open. (Yeah, yeah, Penang is prone to floods. Bad state administration.) So, I scooped up my toddler, minus wearing contact lenses or spectacles (and something else but cannot mention here) and went to my other kids room. My man has to change his sarung into a shorts so he doesn’t have the agility like me. SUrely he cannot run out of our apartment in sarung mah. What if it dropped while rushing down the staircase? And cause some auntie to die of heart attack? Or some SYT or even severals SYTs scampering for him instead? I can’t afford to fight with several SYTs over one man, can I? Wah I managed to get them to jump out of bed so easily. Usually, nothing can wakes them up, not even house on fire threats. This woman who is dressed in a FILA t-shirt with a huge embossed F I L A (thank goodness!) across the chest and a shorts, continued on in her ˜survival mode . Grabbed the keys, open the door, started rushing down from the 3rd floor of our apartment with my toddler in hand and my #3 son following. And the rest of the men? Chey they needed to wear shirt, have to go another room and find the shirt, change shorts etc etc. Wasted precious minutes which can determine between life and death. Men they are like that wan . All our neighbours were rushing down the stair case and it was really, really chiqik/exciting/gempak. My immediate neighbour just had a newborn and was in a state of panic. Poor woman. Don’t laugh, ok? The whole situation at that time was really worrying because the tremors went on for more than a minute. And with the flood siren that is going on, I thought our 5-storey apartment units are going to rubbles. Chey.. it did not happened. Otherwise, I can test my skills like saving lives. So? We were finally on the ground, out in the open. And yikes, I can’t see my neighbours’ faces because I am long and short sighted all in one. My hairs were standing and I got killer’s breath. And the only ‘protection’ I had at that time was a toddler to cover me up. As an afterthought, thank goodness, I can’t see. Or else, I may have noticed a few DOMs trying to spell F I L A. Anyway, all the DOMs were boasting that this is by far the longest and worst tremors. Now, that’s not the end of the story. I have vengeance on my mind. I had been mistaken for a herd of elephants. Only a herd of elephants can make tremors like that. And my man thought I caused the tremors by just walking into the bedroom. Wait till he get the herd of elephants on top of him. Did I manage to make it to church (at 10am)? Yeap, all the more I should go and thank God. I thanked God I wasn’t in the toilet bathing at that time. Or I was wearing my ‘ventilated’ batik nightdress. Nay, just joking .I really do thanked God that our country is free from natural disasters and prayed that there really isn’t any major earthquake around the region. I met Peter in church (around 11.30 am, after mass) and was excited to hear his version. But I suppose his area doesn’t have the same impact or he is less of a SWAT/survival mode person like me. Laugh all you want with my over ‘kan-cheongness’ (excitement) but when you are a mother with so many little children lives in your care, your maternal, protective instinct jumped in. Bra or braless, it doesn’t matter. Who cares if your neighbours see your ‘just jumped out of bed’ look. Safety first. On this sombre day of 26th December, 2005, let us offer our prayers to all the lives losts and to the families who lost their loved ones. One particular man’s image stays on in my mind. He is the father who lost so many children. His faith in Allah has pulled him through and last I read in the paper, he is working as a bus driver, on a different route from his previous job. In times like these, we can see people’s faith in God Almighty shines through. May our faith strengthens by their examples. Let us also ask for God’s blessings for all the people whom had devoted themselves to help these tsunami victims. ADDED -I have gone to KL to claim my Christmas presents. 🙂 Be back dunno when. Hope to log in from KL. i noticed you wrote a bit differently a year ago but nonetheless still a good read, let us all take a minute of silence to pay our respects to the victims of the tsunami. have a good boxing day. In my house, just the baby is not sick. We don’t celebrate Christmas for the obvious reason, but the spirit is around (most of my friends are American Catholics or Baptist). Happy boxing day, too. Aww, poor Marlinda! Get well soon, ok? Wu Ching – Yeah, writing for myself (then) and writing when you know there are people reading (now) is different. I used to be more spontaneous and truthful back then. That’s why I like to read new bloggers’ blogs. Nothing pretentious. I understand the way of writing all too well, hehe. I also got complaints about the profanities and 18sx stuffs i used in my posts too by some family members. You know, my nieces read them too mah. But then, i heck care. My blog what. They know me too well to know that i’ll flak whoever who dares take nonsense about me, lol. I remember being in penang last year on Dec 26. Was in church during the tremors, it was like something holy was happening.